WIND CHILL WARNING: Dangerous cold air temperatures paired with high winds will create life threatening wind chills throughout the day today and into Thursday morning. -40° to -60° feel like temperatures will be felt, which can cause frost bite in 5 minutes. It is crucial that you limit your time outdoors, cover all exposed skin and layer up. Stay inside is the best option. 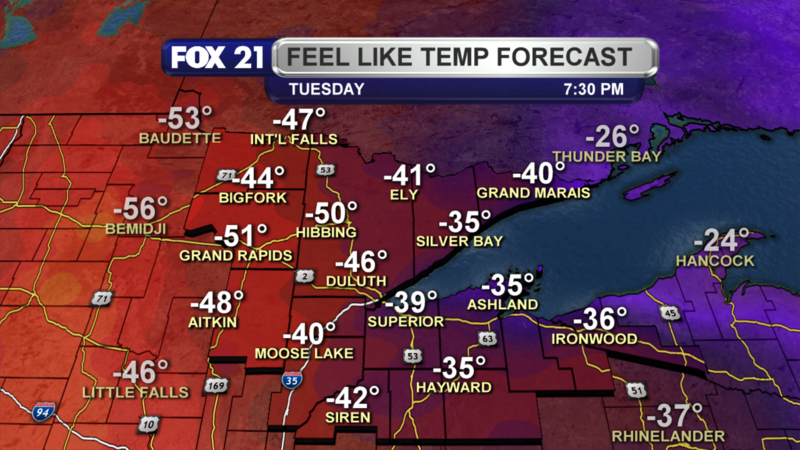 Remember temperatures will be plummeting throughout the day and winds picking up to 30mph. So it will only get colder and colder as the day wears on. 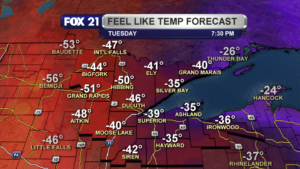 Near record breaking low temperatures arrive overnight (early Wednesday morning), falling to -40° along the Borderlands and -30° expected at the Twin Ports. 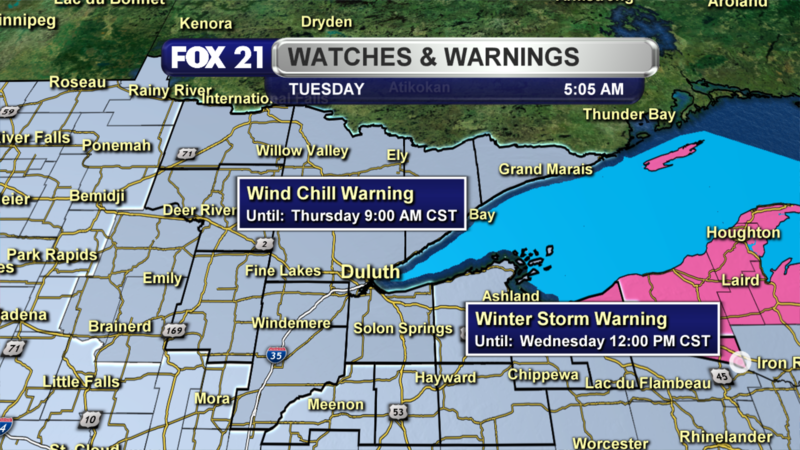 Winds will stay strong, up to 30mph overnight, creating frigid wind chills dropping down to -60° to -70° at times. Frost bite will occur on exposed skin in 5 minutes. Our flesh is not built to handle that cold and wind. Please take this warning serious and stay inside, limit time outdoors, cover all exposed skin and do not sweat. 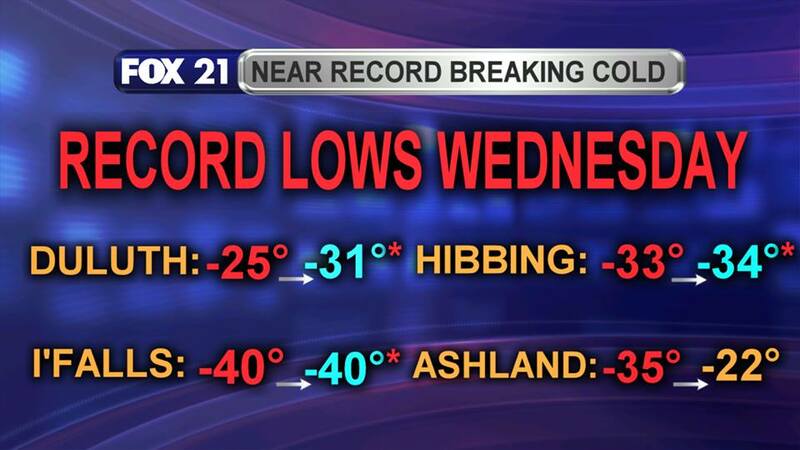 Hypothermia is likely if you overheat at all and step into the life threatening wind chills. Don’t forget about your pets, don’t leave them outside long. Also check on elderly neighbors. Turn the heat up a little higher in your home too, to prevent bursting pipes. Stay warm and safe everyone! 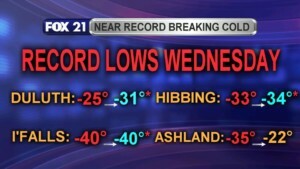 This arctic cold will last through Thursday morning. If you are looking for science projects in the cold weather, throw boiling water into the air from your doorstep. You can also take a wet shirt and leave it outside for 5 minutes (it will freeze stiff! ), try blowing bubbles and catching them on the stick… then watch them freeze solid! Or you can take wet Barbie hair, toss her outside and watch the hair freeze straight in seconds! Again, only do this with your parents and guardians. DO NOT let your skin get wet. And do not stay outside for longer than 3 minutes to try these.